The International Island Games, also known as the Friendly Games, take place every other year. Launched in the Isle of Man in 1985, today’s membership includes 25 islands with populations of 120,000 or less. 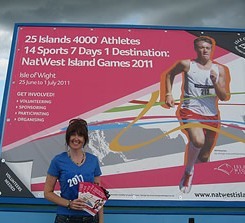 This year the games will be opened by former runner Steven Coe whois now a Lord on Saturday. The Cayman Islands first competed in Gotland, Sweden in 1999 and saw local athletes placing 6th in the medal count. Since then, our competitors have brought home more than 120 medals. “We have high hopes of our team continuing this excellent performance by scooping more medals this year. And while most of us won’t be there to cheer them on in person, I urge everyone to follow their progress and give them a warm welcome when they return after the meet,” Minister Scotland said. Athletics: Sheyla Torres, Ameilia Gillispie, Tyrone Yen, Michael Letterlough, Carl Morgan, Carlos Morgan, Junior Hines, Rhymiech Adolphus and Robert Ibeh. Golf: Samantha Widmer and Emily Ribbins. Table Tennis: Ansel Tempral, CY Elliot, Dante Ramoon and Rohan Clarke. Squash: Janet Sairsingh, Chantelle Day, Marlene West, Caroline Heal, Jaclyn Ridgway, Cameron Stafford, Gabriel Rabess, Warren Urquhart and Malton Blair. Basketball: Samuel O’Garro, ShaadO’Garro, Dwight O’Garro, Leslie Chad, Jerome Narcisse, Cory Thompson, Jorge Ebanks, Rotando Thompson, Jerome Record, Lloyd Samuels, Deandre Simpson and David Terry. Swimming: Lara Butler, David Ebanks, Joel Rombough, Geoffrey Butler, Summer Flowers and Tori Flowers. Cycling: Michele Smith, Michael Testori, Jerome Ameline and TJ Olivier. Shooting: Edison McLean, Andrew Schirn, Kevin Schirn and Christopher Jackson. Tennis: David Berry, Alexander Leonard, Eduardo Torres, Marc Reid, Panac Jha, Nikjil Jha, Carrol Reid, Sian Harrison and Emma Lang. Volleyball: Martin Bodden, Kevin Solomon, Olney Thompson, Richard Campbell, Keeble Knight, Brian Purcell, Davison Ruwende, Shameel Ali, Jacob Strand, Daniel Pattico and Dulian Swaby.